I found that the Canon EF 70-200mm f4L tripod mount fits my FA*300mm lens perfectly for those that want a tripod mount on that lens. I didn't purchase a Canon mount, I got a knock off from China for far less and it is actually a good quality piece of equipment that makes the K20D and lens far more balanced on a tripod. It also takes a lot of stress of the camera body mount even though I really never had any issues with the mount failing no matter what lens I used on it. Last edited by ennacac; Jan 10, 2010 at 7:50 PM. I remember reading that the F*300's mount would also work with the FA (that being one of the few differences between the lenses). It's very neat that the Canon also works - that could be a real benefit since the F*300 mounts are hard to come by (and usually come attached to the lens). Very nice find! I don't believe the F* foot can be attached to the FA*. I've never actually seen an F*, but I believe that the foot is attached by two screws to a rotating collar that's a part of the lens barrel. Apparently, it's REALLY hard to find one. BTW, just to add a little related info to the thread, the tripod collar for the SP 80-200 f2.8 Adaptall 2 also fits the FA*300/4.5 well. I find that I prefer to use my FA*300/4.5 handheld, so I rarely have attached the tripod collar since I found that it would fit, but I carry it in the bag all the time. I also use my FA* hand held most of the time, but I still leave the tripod ring on the lens since it really doesn't get in my way. The lens seem to balance much better on a tripod when attached to a camera with the collar then it does using the mount on the bottom of the camera and even more so with a mono pod. 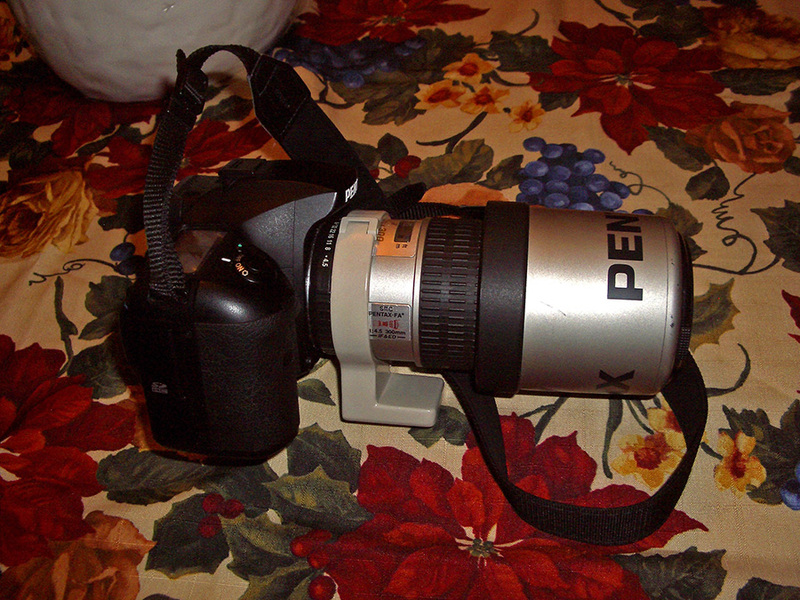 I know the collar on my FA* 80-200 won't work since it has a locking pin to keep it in position and the one off a A 300mm is too small. Anyway, it costs very little (the Chinese version) and it works like a charm. A real neat solution, Tom! A great find I think can be very helpful to other FA* owners too! As Scott says, the F* mount doesn't fit the FA* lens. 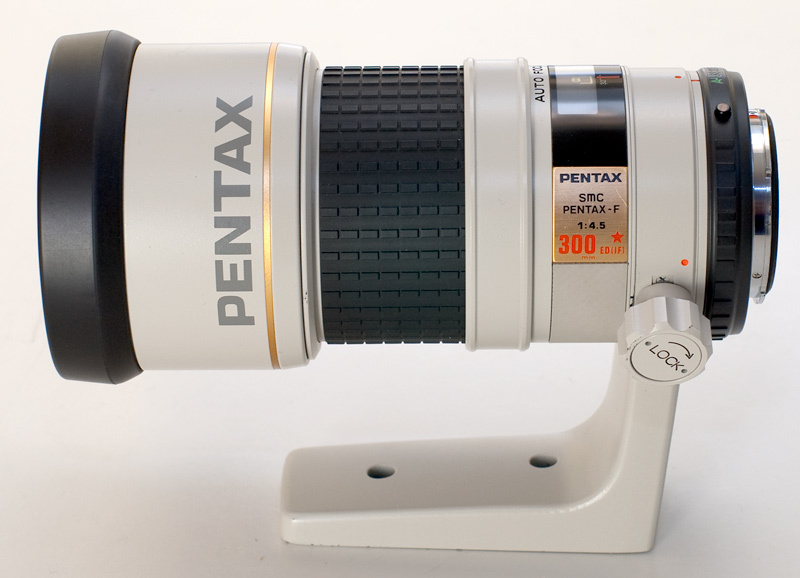 There is an other older Pentax lens tripod collar that does fit, but I can't remember which one. It's offered for sale on ebay from time to time. The A*200mm Macro's tripod mount fits the F*, though, so "when" I get that lens I'll only need to carry one tripod mount. The F* lenses can sometimes be seen for sale without a tripod mount - don't buy it! You'll spend the rest of your life looking for the missing part, and you'll miss it for sure!